This article is 434 days old. As the snow continues to fall, city crews continue to plow. Snow removal crews have been on the roads since 2am plowing arterial and collector routes. The snow from this event is expected to end by 9pm this evening and the city hopes to have all the main routes in good shape by 5am Saturday. 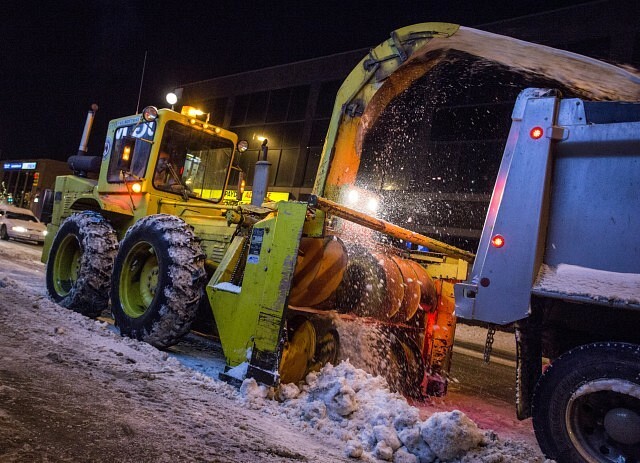 The city is set to begin residential streets at 5am tomorrow with snow contractor, city trucks and contracted forces comprised of road graders, loaders, backhoes, small dump trucks, etc. They will continue to work throughout the weekend to clear the residential streets. As more snow is expected both Saturday and Sunday, City and Contractor plow trucks will be forced out of residential to attend once again to the main routes and then return to residential once main routes are clear. Contracted forces will continue throughout the weekend on residential streets. Residents are reminded that sidewalks abutting their property are their responsibility to clear. All sidewalks are to be cleared 12 hours after the snowfall ends for residential property owners and 4 hours for commercial property owners. As well, under the Highway Traffic Act and City of Windsor By-laws, residents and private snow removal operators are prohibited from pushing snow back onto the street while clearing sidewalks and driveways, as this creates unsafe road conditions for motorists. Windsor Fire and Rescue Services is asking that residents keep fire hydrants clear of snow. In the event of a fire, it will be easier for fire crews to gain access to the hydrant. Patience is also requested with respect to parking lots at the City’s recreation facilities. Plowing of those areas is difficult through the day, as vehicles are parked in the lot. Crews will return after hours when the lots are empty to clear them of snow. That work is expected to last through the night and into tomorrow. Clearing of trails will begin once all lots and abutting sidewalks have been taken care of. Any calls to 311 requesting plowing should be delayed until crews have a reasonable opportunity to have covered all areas. Residents are being asked for patience as well when reporting sidewalks that have not been shovelled, as cleaning up once the snow has finished falling is expected to take some time.